Hi there! I'm on a roll here this week.. a half roll that is. I fell in love with a quilt that Fat Quarter Shop shared on Instagram and decided that I would have to make it. It uses their Orange Peel templates and their Round Robin Pattern. 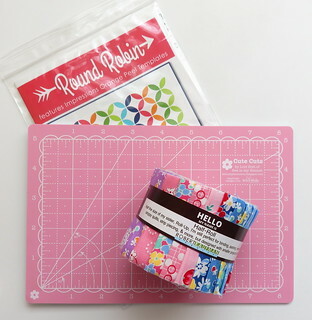 I hopped online and ordered the Birds of Liberty Half Roll and as a special treat I picked up the adorable small Lori Holt Cute Cuts mat. Just because. For some reason, I had thought the half roll was half length strips, like 2 1/2" x 22, why? No idea. It has 18 full width of fabric strips, and if I hadn't already traced my small template onto miles of Quilter's Select Appli-Web Plus I would have made it bigger. As it is, I only used 22 inches of each strip to cut these 144 small orange peels. I'm not sure which fabric I'll use for the background. I need to check my stash of dots or maybe a white on white. Have you seen Nadra's version on Instagram? Precious. Well time to make some decisions. I'm looking forward to a lot of blanket stitching. A LOT! Happy days! It's posts like this that get me in trouble! Those orange peels are very cute. I will have to add the templates to my bag of tools....well it's really a closet but you knew that too! You are super good at blanket stitching!! I think these fabrics would be pretty on a white on white background. 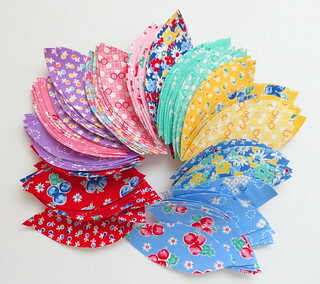 This quilt will feel like springtime and be so adorable.